The nice thing about psychedelic music is that it provides so many avenues to explore, possessing a way of breaking down barriers between styles and modes of composition. Starting with psychedelia, you're only a step or two away from a whole range of sounds, from raga and gamelan to goth and metal. The sense of freedom and exploration it fosters is remarkable, and with out it, it's questionable that any of the bands playing here tonight would exist, even though that liberty takes them all to very different places. Starting things off was Bitchin' Bajas a Chicago three piece who uses keys, synths and saxophone to slowly build insistent drones into reverberating masses of sound, gradually adding simple yet effective rhythms, partly via a laptop, that provide the shape and structure needed to stave off basic navel-gazing. The group shares a member, Cooper Crane, with Windy City psych staples Cave, who also make the most of similarly hypnotic tones, albeit as part of an altogether harder hitting whole. Speaking of Cave, their bass player, Dan Browning, moonlights in Zath, whose lineup also features members of Ga'an and Cacaw. Milwaukee has always been a hard-rock burg at heart, so it shouldn't be a shock to learn that the audience seemed to love every minute of Zath's pummeling, complex thrash. Though there's no shortage of head-banging riffage in their sound, it's fleshed out by a lot of intricate technical flourishes and ambitious, almost prog-y, elements that are actually quite challenging, assuming you can pick them out as they blaze by at bruising speed. Local headliners Catacombz have recently added a few members, though, recently returned from a short tour, they're as tight as ever. The new members jive well, which is no surprise given that Catacombz has always felt more than the sum of its parts, born more of an adventurous approach than a specific group of people. Their set here featured a plethora of new material, which expands on their classic, krautrock-spiked psych with a new sense of swing and some treated vocals. 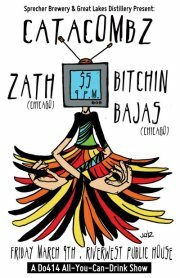 Though they all possess their own distinct styles, the common denominator between Bitchin' Baja's subdued experimentalism, Zath's crushing heaviness and Catacombz skillful navigation of the area in between, is that they're all outgrowths of psychedelia's mind-bending, boundary pushing ethos, the basic tenets of which (a varied sonic palette, repetition, unusual time signatures) can be taken in seemingly any direction, fast/slow, minimal/maximal, without losing their impact, and tonight was an ample, impressive demonstration of that flexibility.